Free standard delivery on all UK mainland tricycle orders only. (Pallet delivery products such as the Odin off road mountain tricycles or any assembled tricycles are not included), one free delivery per order only. If the delivery is refused at the delivery address the re-delivery of the item will be the buyers responsibility. Any charges from a change of delivery address once the item has been posted is the buyers responsibility. Postage charges apply if purchasing in Northern Ireland, Highlands, Non Mainland UK Areas, Republic of Ireland and Europe (Buyers outside the UK are reminded that the currency is GBP). The buyer is responsible for any additional customs and port charges that may occur. Jorvik Tricycles will not be liable for any additional charges or times delays on international postage. We try dispatch all our items within 2 working days of the order being placed on a next day delivery service on in stock, un-assembled tricycles or accessory orders, these time can vary in busy periods. Although we strive to send all orders out within this time, delays can occur. Jorvik tricycles cannot be held responsible for any delays. Delivery times to the Rest of World, Europe, Highlands, Channel Islands and Republic of Ireland will vary. Delays may also occur due to customs clearance or port delays. Our delivery partners strive to deliver on the date specified however there are occasions where this is not possible due unforeseen circumstances. They will aim to deliver the next working day if this is the case. Any dates quoted for delivery are approximate only and we cannot be held liable for any costs incurred if the delivery is delayed. Jorvik Tricycles cannot give an exact time of delivery. Where the courier is unable to deliver the Goods, they will either, attempt to re-deliver the following day or leave a card for you to re-arrange a suitable time for re-delivery. We do not accept liability for any delay in the delivery of the Goods, failure to deliver the Goods where the delay or failure is caused either by an event outside our control, or the customer’s failure to provide us with adequate delivery instructions, or any other instructions that are relevant to the supply of the Goods. Assembled Tricycles are dispatched requiring a 6mm allen key as the handle bars will require an adjustment to position into the correct height to suit the rider. Assembled tricycles gears and brakes will require checking before use in case loosened in transit. It is the customers responsibility to ensure brakes and gears are working correctly and adjusted accordingly. Please note folded assembled tricycles will arrive folded on the pallet. Jorvik Odin tricycles will arrive 90% assembled. The front wheel & handlebars will require fitting, gears and brakes will also require tuning. PLEASE NOTE: Point 7 on page 12 of the instruction booklet is not applicable to the Odin tricycle. Ex-display models, (un-assembled or assembled) are sold on the acceptance that there maybe damage to the body or paintwork. Assembled models will require brakes, derailleur, gears, tyres to be checked and adjusted before use. The buyer of an ex-display model is responsible for any alterations that is required to the brakes, derailleur, gears, tyres. We do not accept liability for the costs of returns, if the information questioned is noted in the adverts or listings. It is the buyer's responsibility to ensure they are purchasing the correct tricycle or accessory. All our trikes are packaged and delivered with the utmost care, but we cannot guarantee they will be blemish free, or that parts may need aligning back into position due to transport. No tricycle is sold as assembled unless agreed prior with the customer and will arrive requiring assembly. As per the adverts we recommend professional assembly and the correct tools used. Jorvik Tricycles will not be held liable for any assembly issues and it is the customers responsibility to always carry out a pre-ride check before any ride. The buyer would be responsible for postage costs to return the item in the case of a change of mind. Maintenance will be the responsibility of the buyer. On delivery, gears can get slightly knocked out of alignment, please adjust the adjuster screws slightly or if mudguards out, please gently move back into position. Taxes and import duty charges incurred are the buyers responsibility. Please check with local customs office to clarify charge amounts. We want you to have confidence in any purchase made from Jorvik Tricycles and we offer a full 12 months parts warranty from the date of purchase. Under the warranty we are not responsible for any losses to you or any 3rd party resulting from the malfunction of the product, and we are not responsible for any accidental damage to the product. Your statutory rights as a consumer are unaffected. Within the warranty, we will supply the new parts and where appropriate, advice on replacing or repairing the part. Defective parts must be returned to us for inspection at the buyers cost, the customer is then liable to collect the product themselves or pay subsequent shipping costs. Once the warranty period has expired on the product we will only offer an advice service. Not covered under the warranty – Brake pads, worn tyres and punctures, worn batteries, worn bearings, worn brakes, general wear & tear or damage to any part of the product due to abuse or misuse,. Labour or servicing carried out by anybody from outside of Jorvik Tricycles. Parts damaged by accidents, neglect, or general wear and tear (Including Lithium Batteries). Damage caused by a non-covered part or by any part not purchased from our facility. Product parts damaged due to not being regularly checked and serviced as recommended in the maintenance section. Rust or weather damage of any kind. Bending back any soft metals such as the mudguards as this is made clear in the disclaimer, can happen due to delivery. It is the customers responsibility to take take care of the tricycle with regular servicing. We reserve the right to determine what damage is due to defective materials and what is due to product abuse or misuse. Extended Warranty will run from the midnight from the final day of the current warranty . Full warranty terms remain. (see above). Warranties are not transferable. Proof of purchase must be provided. All faults must be reported immediately after noticing the fault in writing to info@jorviktricycles.com and photographs or professional reports provided. Jorvik Tricycles will not be held responsible for any repair work carried out by the customer or any third party. If the problem is found to be due to neglect/abuse/accident or not covered under the warranty then the cost of replacement parts and repair will be the customers responsibility. Jorvik Tricycles will not be held liable for any injury or damages occurred whilst using any products purchased. Any adaptations made to a tricycle on a buyers request will alter the terms of the original listing. The adaptation may alter the tricycles original functions. Before the First Ride: please ensure the bike is correctly assembled; check handlebars, wheels, pedals and the saddle are all secure; check the gears and breaks operate correctly and that you are comfortable with how they operate; check the tyres are inflated correctly; ensure no nuts and bolts have become loose or dropped out; adjust the handlebars and seat to the correct height. We advise that all products are ridden with adequate safety clothing i.e. ; helmets etc. If the mudguards seem to be misshapen, please gently adjust back into position. It is the customers responsibility to ensure the correct item(s) have been purchased and is used in the way intended. This covers all goods sold from our company. The Companies liability will be limited to the value of the goods only and not for any consequential damages, injuries or losses howsoever caused. It is the customers responsibility to check the safety of the product purchased before use and Jorvik Tricycles shall not be liable for any damage or injury caused to the customer by the use of any of the goods we sell. We recommend to have the tricycle professionally assembled or if it does come assembled please make sure before the first ride to carefully read the information in the cycle maintenance section. Assembly and user instructions provided in the boxes are to cover all models, please only use as a guide only. All ex-display tricycles are excluded from any sales discounts or promotions. The layout of this website, the graphics/written content used and the collection of contributions are copyrighted. The pages may only be copied for private use, changes may not be made and copies may not be distributed or used for public reproduction. Copying of information or data, especially the use of text, text passages, or pictures requires the prior agreement of Jorvik Tricycles Ltd.
All orders you place on this website will be subject to our acceptance in accordance with these terms and conditions. The ‘confirmation’ stage sets out the final details of your order. Following this, we will send you an email acknowledging the Goods you have ordered from us and the delivery services ordered from the delivery service provider. Please note this email is not an order confirmation or order acceptance from Jorvik Tricycles. Acceptance of your order and the completion of contract between you and us will take place on dispatch to you by the delivery service provider of the Goods ordered, unless we have notified you that we do not accept your order or you have cancelled it. Please note the price you pay for goods supplied by Jorvik Tricycles, and the delivery service provided by the delivery service provider, is the price displayed on this website at the time we receive your order, apart from the following exception: Whilst we try and ensure all prices on our website are accurate, errors may occur. Should we discover an error in the price of goods you have ordered we will inform you as soon as possible. At this time we would give you the option of reconfirming your order at the correct price or cancelling it with monies paid refunded. If we are unable to contact you, we will treat the order as cancelled. All specifications are advised by the manufacturer, however these can be subject to change by the manufacturer at any time, without prior warning. This acceptable use policy sets out the terms between you and us under which you may access via www.jorviktricycles.com (hereinafter separately and collectively referred to as the “Websites”). This acceptable use policy applies to all users of, and visitors to, our websites (including all international). The Websites may only be used by you for lawful purposes and may not, in any way or event, be used: in any way that is unlawful (under local, national or international law) or fraudulent, or has any unlawful or fraudulent purpose or effect; for the purpose of harming or attempting to harm minors in any way; to send, knowingly receive, upload, download, use or re-use any material which does not lawfully belong to you; to transmit, or procure the sending of, any unsolicited or unauthorised advertising or promotional material or any other form of similar solicitation (spam); to knowingly transmit any data, send or upload any material that contains viruses, Trojan horses, worms, time-bombs, keystroke loggers, spyware, adware or any other harmful programs or similar computer code designed to adversely affect the operation of the Websites, or any computer software or hardware. Jorvik Tricycles offer a 14 day money back guarantee on all purchases. The buyer is responsible for arranging the return, postage costs and the product must be returned in an unused, re-saleable condition, in its original packaging and must include any extra items. Returns with clear signs of damages or wear and tear will be refused. We cannot accept returns on assembled tricycles. Delivery costs will be deducted from the refund amount, for UK mainland deliveries where the tricycle was sent un-assembled this fee is £25, on assembled tricycles sent via a pallet service the fees are £130. For non-UK mainland and international returns costs vary. There is a £30 restocking fee on all models. Returns Address – Jorvik Tricycles, Unit 6 Yorvale Business Park, Hazel Court, York, YO10 3DR. You should expect your return to be processed within 2 weeks of Jorvik Tricycles receiving the return. Refunds will take 5- 10 business days after the return has been processed. It is the buyer’s responsibility to ensure the tricycle is the correct size or that they have test rode before any purchase. A Jorvik Tricycles return form must completed and returned prior to returning the tricycle, this can be downloaded by clicking here or this can be emailed to you by calling the office and requesting the form to be emailed. Please return the completed form to info@jorviktricycles.com or to the address above. Returns will only be accepted once a completed returns form has been received by Jorvik Tricycles. For any queries and complaints please email info@jorviktricycles.com and one of our dedicated team will endeavour to contact you back within 24 hours. Please check the tricycle/parts carefully before the assembly process as we cannot refund or replace on scratches, breakages, wiring, part damage, truing, punctures once this has started. Please check the items carefully and report any damages/faults and include a damage description, any comments made to the driver and photographs. If the buyer signs for the item as arriving in good condition we cannot accept a damage in transit claim. Customer satisfaction is our number one priority. If you receive your goods and they are damaged or faulty in any way, you must notify us immediately. Do not start the assembly as we cannot accept returns once this has taken place. We could only offer advice and parts under the warranty. Jorvik Tricycles Ltd will run an inspection report on the items return to diagnose fault/damage. Current consumer protection legislation states that items must be as described, fit for purpose and of satisfactory quality. If you purchase a product online which is found to be faulty within 30 days then you are entitled to request a full refund of the faulty product as long as the product has not been assembled. Should a fault occur after the initial 30 days, we are entitled to repair and/or replace that item (see 1 year parts warranty). If it cannot be repaired or replaced, then you may be entitled to a refund. Advice about your legal rights is available from your local Citizens’ Advice Bureau or Trading Standards office. Any damages which have not been prior notified, proof of assembly or damage which has been caused in the return transit due to poor packaging will be deducted from the refund. It is the buyers responsibility to ensure safe return of any items. 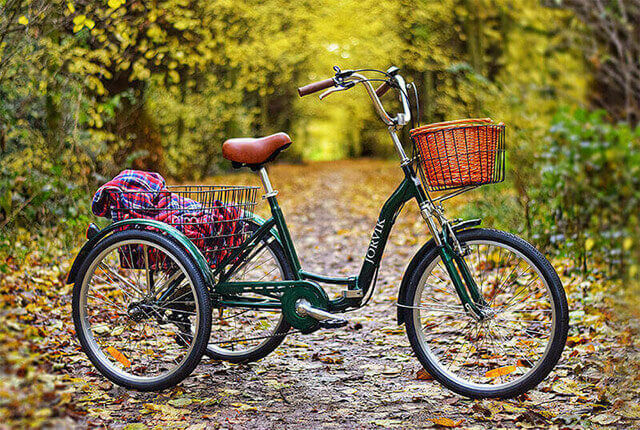 If the tricycle or any accessories are returned damaged or a fault has been caused by the customer due to deliberate damage, accidental damage, wear and tear, or damaged in an attempted assembly of a Jorvik Tricycle technician will write a report and include the costs of the repair or replacement. This will then be deducted from the refund along with any returns postage costs (where applicable) or the return/refund maybe refused and it will be the buyers responsibility to re-collect the item from Jorvik Tricycles Ltd depot. Please use the original packaging when sending your items back and make sure it's securely packaged, Jorvik Tricycles Ltd cannot be held responsible for any damage during posting. Jorvik Tricycles Ltd will only cover returns costs for un-assembled items in similar sized boxes only and are not liable for any assembly or un-assembly costs. If an item found not to be faulty the postage & restocking fees will be deducted. If the item is not in re-saleable condition the return can be refused and it will be the buyers responsibility to collect the item. We will not accept rust/weather damage as a fault and it will not be covered in the warranty. It is the buyers responsibility to ensure the tricycles care and maintenance. Please refer to our cycle maintenance page for tips and advice. It is the buyers responsibility to ensure items are safely returned. If there is no packaging causing items to protrude from the box, delivery can be refused. If you’re buying a new electrical item, we will recycle your old one and any other small electricals you have for free. Why recycle? Unwanted electrical equipment is the UKs fastest growing type of waste. Many electrical items can be repaired or recycled, saving natural resources and the environment. If you do not recycle, electrical equipment will end up in landfill where hazardous substances will leak out and cause soil and water contamination – harming wildlife and also human health. We can help. We are pleased to offer our customers the chance to recycle their old electrical items when purchasing a new item from us. Please speak to a member of staff for details on how to dispose of your WEEE item. Jorvik Tricycles Ltd are not responsible for any assembly/un-assembly costs. Jorvik Tricycles will not replace parts without the return of the faulty part which will be at the buyers expense. Tricycles agreed and sold as second or pre damaged at a discounted price are non refundable. Tricycle parts - made in Asia/Accessories - made in the United Kingdom.